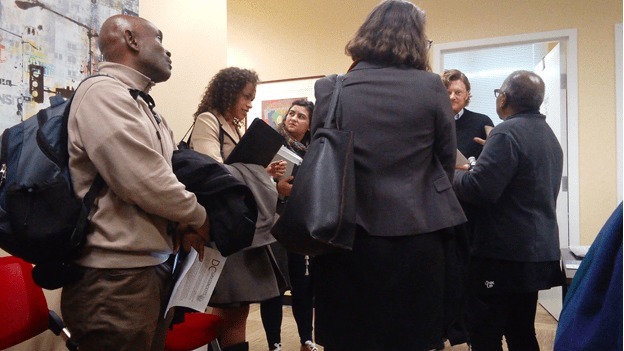 Members of the D.C. Grassroots Planning Coalition visited D.C. councilmembers on Nov. 30 to talk about the need for tougher protections against displacement and gentrification in the overhaul of the city’s comprehensive plan that began in 2017. The plan, which governs zoning, development and land use throughout the District, was first created in the 80’s, thanks to a law that requires the mayor to submit to the council a plan for land use for the purpose of guiding development and policies that the District will need over time. Over the years the city-led plan has changed dramatically. Both the Anthony Williams administration and the Vincent Gray administration spent significant time amending it. Changes the Bowser administration makes could affect the future of large development projects, such as those already in progress in the Brookland Manor and Brentwood Village neighborhoods in Ward 5, both of which are older apartment complexes built in the first half of the twentieth century. These communities have been home to low-income African-Americans, many of whom belong to large multi-generational families with close ties. Some residents have been resisting development for the past two to three years. The tenants association, which does not represent all tenants, wants a project where everyone who is there now can stay, according to Davis. Mendelson’s legislative assistant, Mike Battle, listened to their concerns and said the orders said that because of the overall benefit displacement was acceptable It’s not the same thing as a benefit he sailed. The group then moved on to other offices to continue the push for a resolution to cement the Framework element of the comprehensive plan, which was debated in a marathon hearing earlier this year but has yet to be put before the council as draft legislation. The Framework’s proposal packet was roughly 60 pages long. According to the D.C. Grassroots Planning Coalition, what they saw in the legislation does not fully agree with what the community needs as far as land use, housing information, and an end to homelessness. Chairman Mendelson hopes to get in a vote on the Framework before the 2019 budget season this coming spring.